I have always loved the kind of science fiction where you think about a world that is largely like our own, but in some fundamental way different. What if we all lived underwater, or if the force of gravity was lower, or if the sun were a weaker star? To me, that’s what the world of quantum physics is like: in a lot of ways it’s similar to our own world, in fact it’s the basis of our world! But it’s also crazy and strange. So what would it be like if we were quantum creatures, if we could actually see how everything around us is quantized? Well first, there’s what it means to be quantum. A quantum of anything is a piece that can’t be subdivided any further, the smallest possible unit. But this implies a sort of graininess, where rather than a continuous stream of, say, light, we start to see at the small scale that light is actually composed of little chunks, quanta of light. Imagine being able to see how everything around you is made of discrete pieces, from light to sound to matter. When the sun came up, you’d see it getting lighter in jumps. When you turn up your music, you’d hear each step of higher volume. And as your hair grew, you’d see it lengthening in little blips. And at the quantum scale, the wave nature of everything becomes indisputably clear. We normally think of waves as something that emerges from a lot of individual objects acting together, like the water molecules in the sea, or people in a crowd. But if you look at quanta, you actually find that those indivisible packets of light or sound or matter are also waves, waves in different fields of reality. That’s hard to get your head around, but think of it this way: as a quantum wave, if you passed right by a corner, you could actually bend around the back of it a little the way that ripples going around a rock in water do. 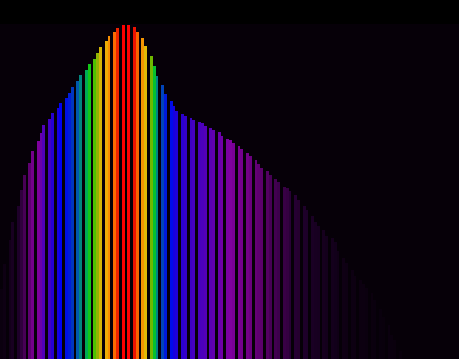 Things like electrons and photons of light actually do this, so for example the pattern below is made by light going through a circular hole, and the wave diffraction is clearly visible. Amazingly, as a wave, you could actually have a slight overlap with the person next to you. This gets at something that’s key to quantumness: the probabilistic nature of it. Say I thought you were nearby, and I wanted to measure your position somehow to see how close you were to me. I’d need to get a quantum of something else to interact with you, but because it would be a similar size to you, it would slightly change your position, or your speed. We don’t notice the recoil when sound waves bounce off us in the macroscale world, but if we were very small we would! So there is actually a built in uncertainty when dealing with quantum objects, but we can say there’s a probability that they are in one place or another. So as a quantum creature, you can think of yourself as a little wave of probability, that collapses to a point when measured but then expands out again after. When I’m not measuring you, where are you really? Well I can’t say physically, and this is why you can have a little wave overlap with your neighbour without violating the principle that you can’t both be in the same place at the same time. And imagine that you’re next to a wall. As a wave you may have a little overlap of probability with that wall. And if the wall is thin enough, as a quantum object there is actually some chance that you’ll pass through the wall entirely! This is called quantum tunnelling, and actually it’s happening all the time in the electronics inside your phone. Modern microelectronics work in part because we can use effects from the quantum world in our own, larger world! It’s difficult to imagine a world where everything happens in discrete chunks, where I can see myself as a wave, where I don’t know where I am until someone else interacts with me. But this is the world at the quantum scale, and it’s not science fiction! This entry was posted in Physics and tagged nanoscale, photons, physics, quantum, quantum mechanics, science. Bookmark the permalink.